Thousands of Wales' fans have seen their rugby team take another step towards the Six Nations Grand Slam with a win at Murrayfield on Sunday. Wales beat Scotland and is now the only side able to win the Grand Slam after Ireland lost to France. The final score was Wales 46, Scotland 22. They will now face Ireland next Saturday at the Millennium Stadium when they will attempt to win their first Grand Slam since 1978. Around 40,000 Welsh fans are thought to have made the trek north to Edinburgh to see if their side can win their first Grand Slam since the Welsh rugby heyday of the 1970s. Rugby supporters had arranged a total of 20 chartered flights for the trip to Edinburgh on Friday, doubling Cardiff International Airport's usual passenger numbers. A further 1,500 fans flew out on Thursday and Saturday. 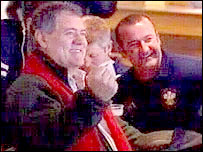 Veteran performer Max Boyce was among those who were cheering on Wales at Murrayfield. Before the game, he said the sight of so many Welsh fans at Murrayfield would nullify any home advantage the Scottish team might expect. "I can't remember ever seeing so many people travelling to Scotland - it's got to be great for Welsh hopes." One couple who also made the trip north were Ceredigion farmers Gwyn and Enid Jones, who met at the Wales-Scotland game 30 years ago. The pair, both 51, from Llanrhystud, near Aberystwyth, have visited Edinburgh many times since but said this trip would be particularly special. 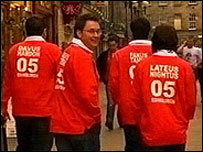 In 1975 Wales lost, but this time round the Joneses will be able to join the rest of the celebrating Welsh fans.